As a data analyst for the UT Austin Digital Media Research Group, I am currently working on a dataset released by Buzzfeed in May 2017. This dataset includes scraped data from partisan Facebook pages during the 2016 election campaign. We chose to analyze the top 40 Facebook partisan pages (20 right, 20 left), with a sample size of 300,000 messages. Our selected time frame is April 4, 2016, when the Facebook reactions were first released, to March 31, 2017, when the data was scraped. Our research studies the type of partisan news that elicits specific emotional reactions. Thus, the new emoji reactions present us with an interesting proxy for studying human emotional reaction to news online. Because reactions are a new Facebook feature, we expect that use of the emojis "angry, haha, sad, wow, and love" will become increasingly popular and normalized over time. In the graph below, we see this already happening — though the 'like' button remains popular (perhaps for its convenience and neutrality). We approached this data project after a literature review concerning the moral profiles of liberals and conservatives. Namely, liberals and conservatives have different moral profiles (among five moral domains): liberals endorse harm/care, fairness/reciprocity; whereas conservatives endorse in-group/loyalty, authority/respect, and purity/sanctity (Graham et al, 2009). Additionally, according to Ridout and Searles (2011), Republicans are more likely than Democrats to use fear and anger appeals. Based on this literature, our group hypothesized that right leaning Facebook pages were likely to elicit anger more often than left leaning Facebook pages. Very early in my investigation of the data, I found that this is not the case. The graph below illustrates how Facebook users tend to react the same on average to right and left page statuses (n = 300,000). In social science it is often hard to disprove previous studies, but here we have strong evidence against Graham's moral profile study and against Ridout and Searles belief that Republicans are more likely than Democrats to elicit fear and anger. Of course, more research will be necessary to strengthen our claim and to investigate lurking variables. We are currently working on content analysis of a sample of Facebook messages, to categorize the issue, emotion, and rhetoric present. We then plan to see if there are correlations between the content of the message and the reaction it received. This may show us how news sources may strategize to elicit strong reactions. A future project will be to test whether emoji reactions are in fact a good proxy for our human emotions. German election geolocated Tweets (n = 1000), captured one day after the election. Twitter served as an important platform for discourse amongst Alternative for Deutschland (AfD) supporters during the 2017 German election. Established in 2013, this relatively new party ran for the Bundestag and succeeded in acquiring 12.9% of the nations' vote in September 14, 2017. With the help of Harris Media, a company specializing in social media strategy, AfD achieved a high level of salience online, leading to legitimization and increased news coverage. How the demographics of AfD supporters on Twitter differ from actual voter results? Is Twitter a useful tool to study this community— what groups can and can't we study? Preliminary results Left: 1000 geolocated Tweets from my corpus of Tweets. Right: Election results published by BBC. Tweets are not clustered in Easter Germany, where AfD vote share were highest. 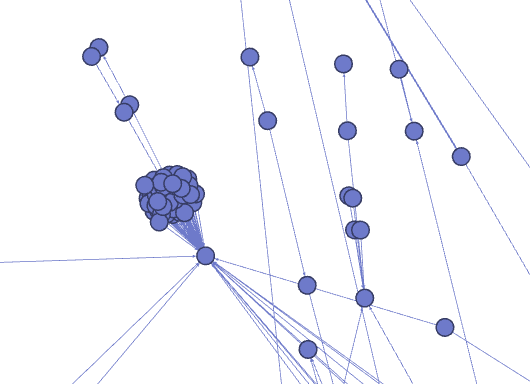 Preliminary Results: Utilizing network analysis proves useful in combing for simple bots, which tend to be isolated from the main network, yet have a high in-degree due to an army of bots created for the sole purpose of increasing the main bot's follower network. Below is an example of a bot which Twitter identified and suspended during the German elections. After gathering demographic information (a large project in itself), I will move on to analyzing the actual content of the Tweets. RQ1: How did AfD members/supporters use Twitter for conversation during the German elections within their community and to engage with supporters outside their community and how did this evolve over time? RQ2: What content and conversations exist amongst the AfD community? User-base: have new users joined the conversation since the election campaign started? Are users creating content or re-tweeting posters/slogans/speeches? My undergrad thesis consists of a consultant-like study of Ankuri, an NGO I interned at in India that empowers women through a knitting program. Research is based on surveys & interviews I designed & implemented while there. My thesis involves analysis of human rights, labor patterns, and empowerment of women in rural India, using statistical, network, and ethnographic analysis. Below you will a conference poster of some of the most useful insights my study generated. You can download the full poster here. The full article research article is found here.